We are really excited to annouce today that CaptiveXS Solution is now available for purchase directly on our site from pricing section as well as from Amazon Marketplace. 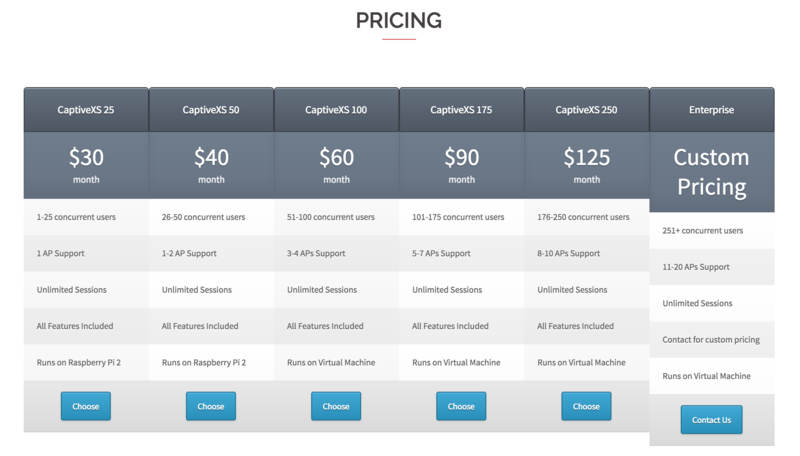 Pricing information for each form factor is also on the pricing table. You are now able to buy any solution of your liking directly from our site through paypal. Right after the purchase, you will receive software link to download as well as installation instruction in the email. In addition, for CaptiveXS 25 and CaptiveXS 50 we will also ship the preloaded microsd card for raspberrry pi based solution. Currently CaptiveXS 25 and CaptiveXS 50 can also be purchased directly from Amazon Marketplace. Please note that Amazon purchase option is only available to US customers at this point. However, we will soon be expanding our selection for solution form factors as well as countries you can purchase from. In the meantime you can always buy any solution from any country directly from our site for the most efficient experience. Please feel free leave your feedback or thoughts in comment box below.